A Concert on the Green event in 2016 at the Newport Beach Civic Center. 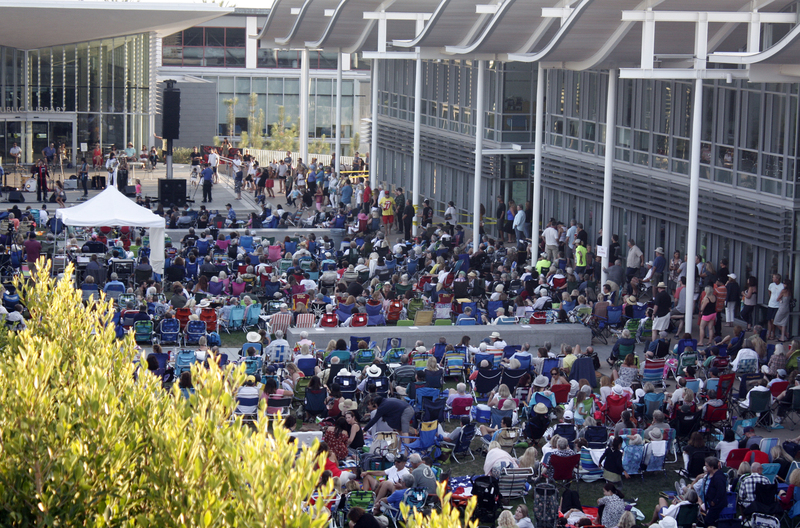 The popular Concerts on the Green series will once again bring thousands of music lovers to the Civic Center lawn this summer. Four acts were approved by the arts commission last Thursday during their monthly meeting. The performers for the summer series are a Sinatra-esque ensemble by Huntington Beach-based Tijuana Dogs, an Eagles tribute band called Deserado, a Bruce Springsteen tribute band called Springsteen Experience, and I AM KING – The Michael Jackson Experience. Desperado and Springsteen Experience are making return visits to the Concerts on the Green. Performing first will be Tijuana Dogs, who will wrap up the Newport Beach 54th Annual Arts Exhibition on June 16. The event typical draws over 2,000 people, so even more are expected to attend with the addition of the concert aspect. Desperado is slated for as-yet scheduled date in July. Springsteen Experience is expected to play in August, and I AM KING is set for September. The exact dates for those bands have not been confirmed. During public comments, resident Jim Mosher suggested that in the future, the subcommittee identify more than enough acts for the available performance dates, and then allow public comment on which bands should be selected. The bands were recommended by the Performing Arts Ad Hoc Subcommittee and unanimously approved by the commissioners. Barbara Glabman moved for the approval and Miriam Baker seconded. Chair Judy Chang and Michele Bendetti were absent. The concerts themselves bring nearly 3,000 people to the Civic Center for each show and are free to the public. A new photo contest that centers on the newest phase of the rotating sculpture garden was announced as well. 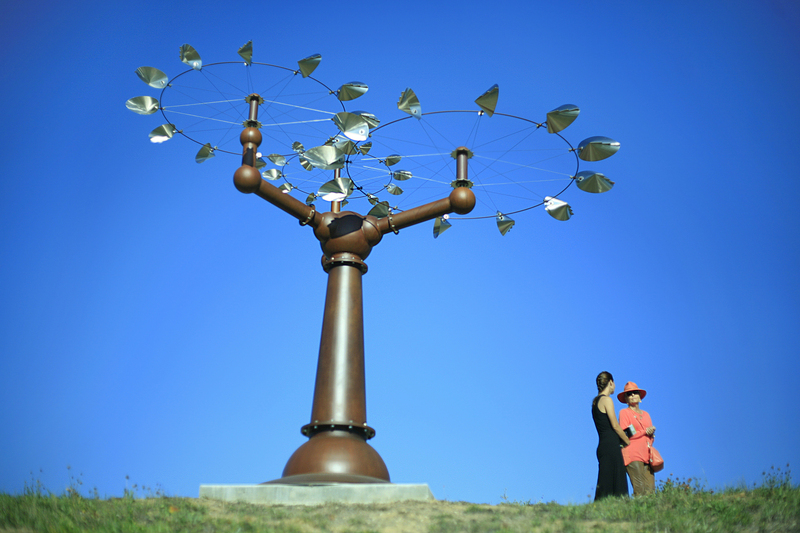 Visitors walk by David Boyer’s Getting Your Bearings at the Newport Beach Civic Center Park sculpture exhibition opening in November. Designed to encourage visitors to the exhibition and open to all ages, the photo contest was conceived by Glabman. “We’re excited, and we want to get the community really excited about the sculptures that are out there for everyone to see,” Glabman shared. The contest idea was inspired by Glabman’s friends that were taking their grandchildren out to the sculptures for photos. Prizes will be given for the three best photographs. “Some of our sculptures are very easy to figure out something fun to do with, some of them you have to be little bit more creative,” Glabman noted of the nine new sculptures. She said the photographs should include interaction with the sculptures, but that people should refrain from climbing on them. “We hope that it will get a lot of people out into the sculpture garden with their families,” she said. Resident Virginia Hayter also approved of the contest. She has noticed many creative young adults in the garden already. “You would be surprised how many teenagers come and fashion people come and take pictures up in the sculpture garden,” Hayter said. It’s important to note that the art is inspiring others, Commissioner Grace Divine pointed out. Entries will be accepted from Feb. 1 through April 15. Complete entry guidelines and instructions can be found on the website: newportbeachca.gov/culturalarts. Grand prize, runner up and honorable mention will be awarded. Prizes include gift certificates donated by local restaurants, including Modo Mio Rustic Italian Kitchen, Bluewater Grill, and Bistango. Winning photos will be displayed on the city’s Cultural Arts website.